Ever since I heard that the WiiU was going to get the newest Splinter Cell title; I decided on the spot that I was going to get this game. Before Blacklist the only other Splinter Cell game I played was Double Agent on the Wii, and I put only about 20 minutes into it before I lost interest. With Blacklist I really just wanted to try my hand at a stealth action game, I’d never played one before so I figured now would be a good time. 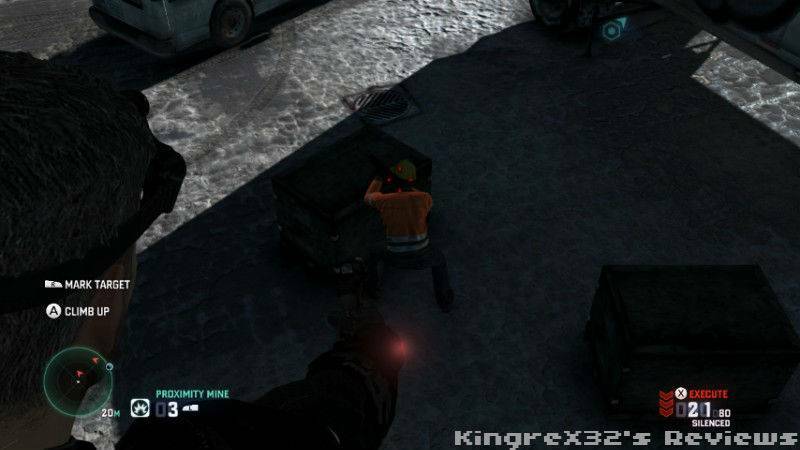 Splinter Cell Blacklist is a third person Stealth Action game, it was Published by Ubisoft and developed by Ubisoft Toronto, Red Storm, Montreal, and Shanghai, It was released on August 20th 2013. A terrorist group called the Engineers has attacked an American base in Guam and has threatened further attacks on the US unless they pull out all of their soldiers on foreign nation’s soil. Under orders from the President the newly created Fourth Echelon commanded by Sam Fisher is tasked with investigating and stopping the attacks. Since I hadn’t played a stealth action game before Blacklist I went into this game very cautiously, trying to do everything the “proper way”. It was ultimately unnecessary as Blacklist is very accessible; while you can’t just go around shooting up everything you see like in Call of Duty the game offers Three Play Styles for gamers to choose from, Ghost, Panther, and Assault. 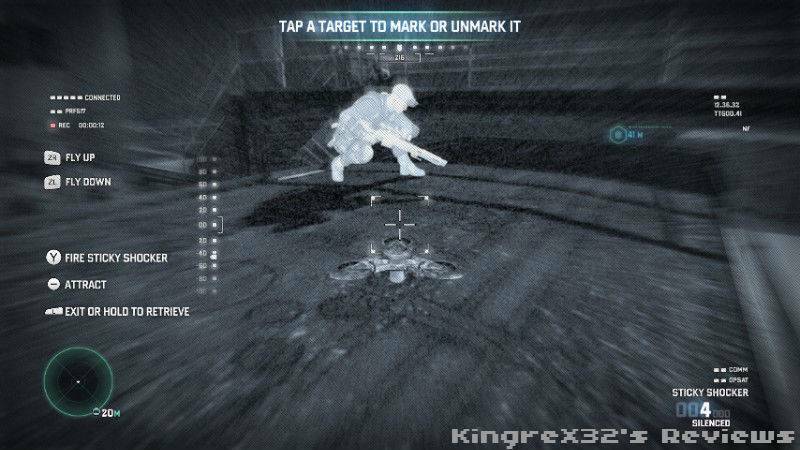 Ghost: is more or less the classic way of playing Splinter Cell, completing a mission without getting detected or disturbing enemies is the way to get Ghost. Players that choose Ghost Style get the most cash after missions. Panther style is like a compromise between Ghost and Assault. Killing enemies stealthily and hiding bodies are the premier elements of Panther style. With Assault style while it’s not recommended, it is possible, but very difficult as the game is primarily a stealth game, that and the fact that your Ops Suit doesn’t have much armour. This is the lowest paying play style. Even though you have a choice of how you want to play the game during a mission you are not confined to only one style. There will be times is a mission where you have no choice but to fight your way through, or sneak past a few guards or even knockout a few to complete an objective. 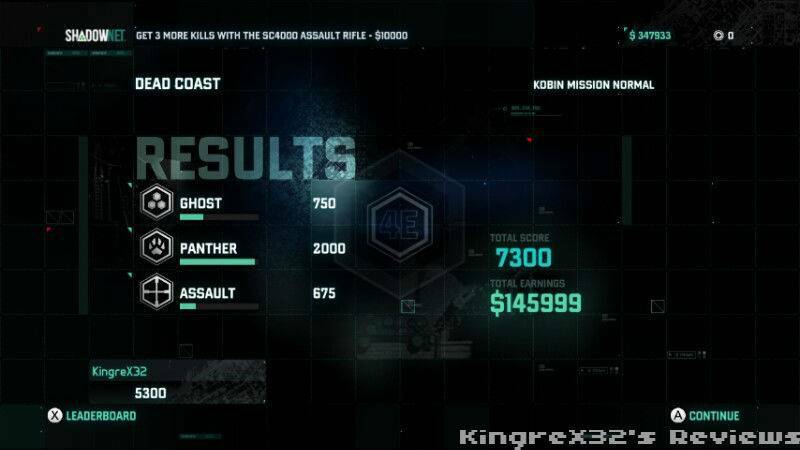 As you complete missions you are rewarded with cash which is used for upgrades to your weapons and suits. As the game continues and you find a play style that suits you its good to customise your Ops Suit to reflect that specific style. Every part of the suit from Gloves to boots has multiple options for you choose from, some increase weapons handling, others help you make less noise when you walk, taking the time out to go through and personalize your suit will really make a difference. Not only is your suit customisable but so are your weapons, everything you can think of can be added to your weapons from silencers, armour piercing rounds, sights and lasers etc; and not only in the campaign you’re suits for the online game mode Spies vs. Mercs are also upgradable and customisable in the same fashion. While having the best suit and weapons are nice no load out is complete without gadgets, and in Blacklist you have a variety of them to choose from. Gadgets can be anything from distractionary like the sticky noise maker, to full on assault type devices like proximity mines. Each mission is different requiring different gadgets in order to complete objectives so it’s good to experiment. In order to stop the Blacklist you need to take on Missions; Missions are launched from the SMI (Strategic Mission Interface) on Paladin. In addition to the main objectives most missions have optional objectives that can be completed for extra money. Optional objectives include capturing high value targets, collecting dead drops, and hacking engineer laptops. In addition to the games campaign you will also get missions from the members of your team called Fourth Echelon missions; these missions are given to you by the members of the Fourth Echelon team and they are separate from the campaign so can be played whenever you want. Each mission is different in that each one requires one of the different Play styles mentioned in order to complete it. 4E Missions given to you by Charlie can either be played using Either Panther or Assault style. In these missions the objective is to fight off waves of enemies until it’s safe to extract. 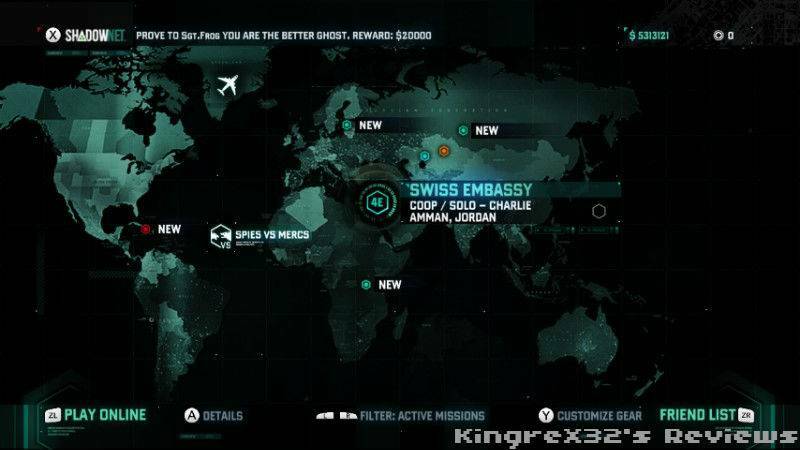 4E missions from Grim focus primarily on Ghost and panther styles, the objective in these missions is to hack three different devices without being caught. If you are caught the mission is an automatic fail and must be started over from the beginning. 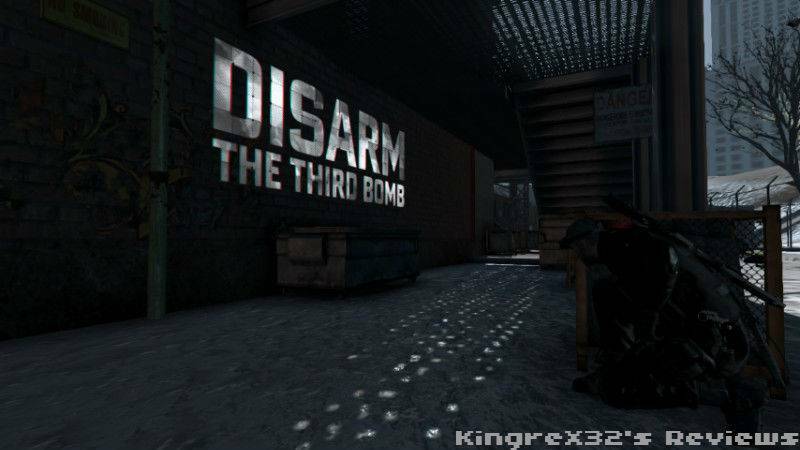 Kobin 4E missions involve taking out all the enemies in an area by any means necessary. If you are caught it’s not an automatic fail but enemies will call in reinforcements. Briggs missions are co-op only and tell a side story of Sam and Briggs mission to stop rouge division of the agency Voron. Briggs missions focus on all three styles. 4E Missions can be played either solo or through online co-op. 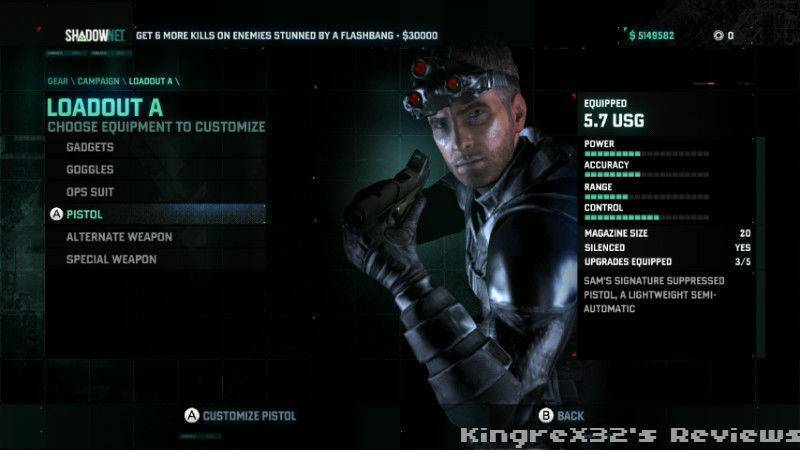 Splinter Cell Blacklist features the return of the Spies vs Mercs game mode. As the name implies in this mode you can play as either a Spy (their objective is to hack terminals protected by Mercs) or a Merc (their objective is to protect terminals from being hacks by spies). Each side plays different Spies have almost no body armour and must sneak around Mercs in order to complete their objectives. Mercs are heavily armoured, but are slower and make more noise than spies. This mode is played in teams of two. Blacklist mode is like Spies vs Mercs, the differences are customisable classes and teams of four. Like most WiiU games Blacklist supports Off TV Play, and Miiverse integration. Being a Ubisoft title the game also has Uplay support giving gamers a chance to get exclusive items and upgrades, there are also a few DLC packs on the WiiU eshop that add more weapons, and multiplayer maps to the game. Graphically the game is smooth, it looks smooth, it runs smooth, it plays smooth. 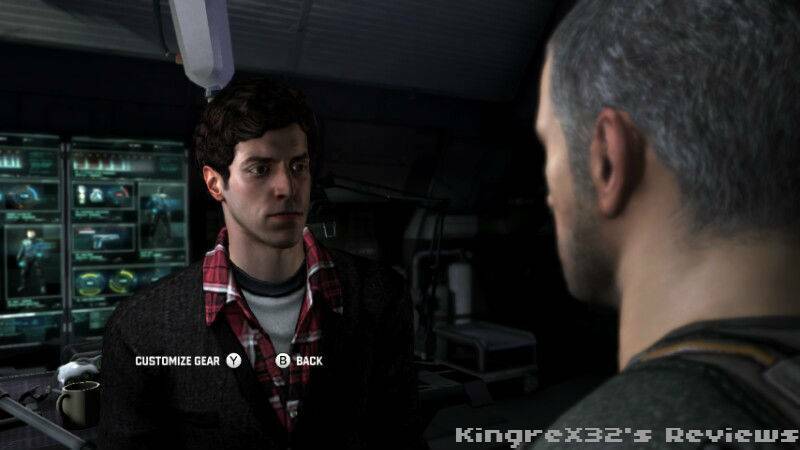 The lighting and textures are great also, during cut scenes though and close ups you can see that some of the textures are a bit last gen, but again it’s a problem only if you are looking for it. Gameplay wise, with wide assortment of weapons, gadgets and play styles for you to choose from the game never feels repetitive or boring. Control wise, the game uses the WiiU gamepad but can also be played with the Gamepad Pro. When it comes to the negative there are a few things worth mentioning, since the WiiU does not support installing a game to the system load times for Splinter Cell are pretty long, 20 to 40 seconds is about the time you will spend on the load screen. Lastly online matches are most times very hard to find, it’s like no one is online ever. But when you do find a match it’s flawless, there is no lag and the game supports voice chat through the gamepad. Once again I love that Ubisoft has included DLC in another one of its WiiU titles (the first being Assassins Creed 3), and even without the DLC this is a game with a great length at least 10 to 20 hours depending on how you play. If you’ve never played a Stealth action game before or are just tired of playing First Person Shooters, give this game a try. It is defiantly worth your while. 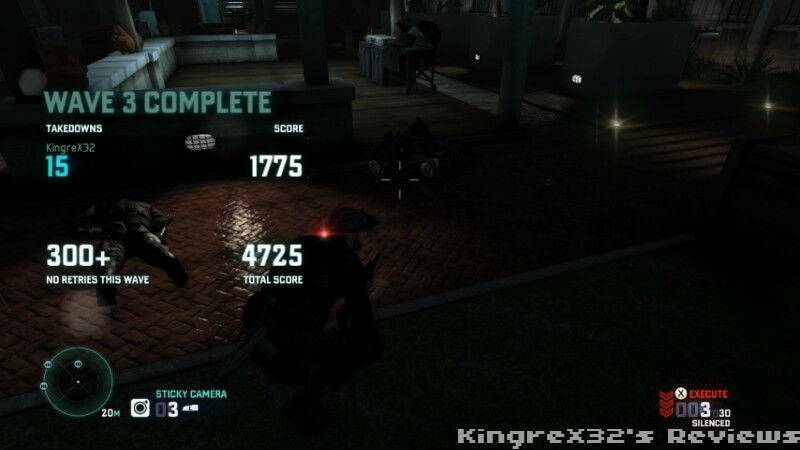 Splinter Cell Blacklist gets 9.7 out of 10. This review can be read here. I don't enjoy very violent games, but I do think the media blows video game violence out of proportion. Games like this would not turn someone who isn't already a killer into one. 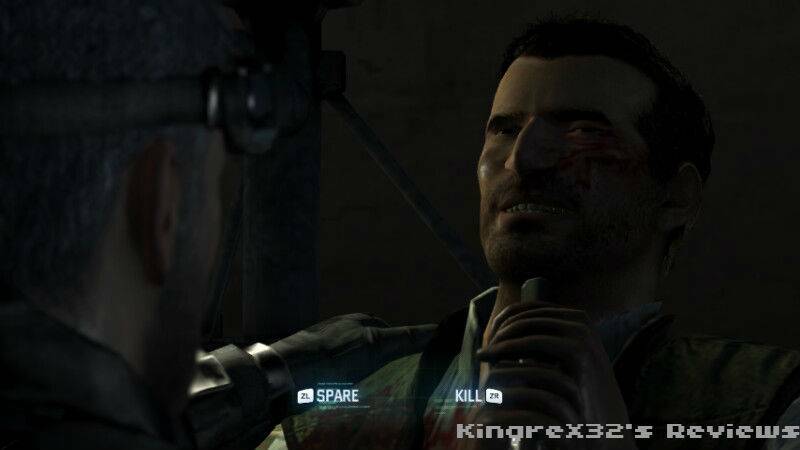 Was this the last Splinter Cell game now that Tom Clancy has died? Not sure. Tom Clancy Wrote alot of books, not Just Splinter cell. The dinosaur is back lol. Welcome back and nice review. well i would say back just yet. I'm still super busy with other things, but thanks though. Dinosaur? He isn't old you know. Great review! 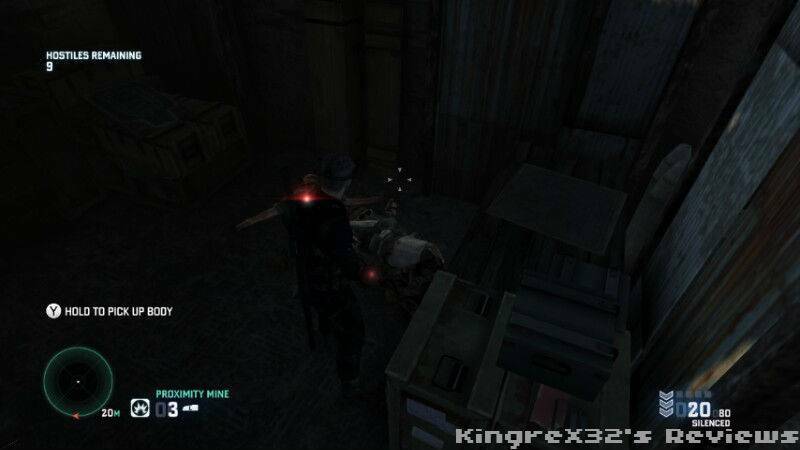 This is one of the best Splinter Cell games I have ever played. edit- lol nevermind you are referring to his username aren't you. I no like game like this, but I do like review. What dont you like about it? Thanks for posting yet another superb review @KingreX32.